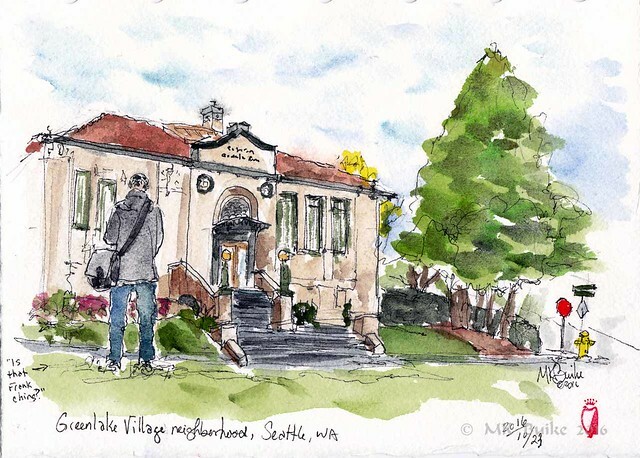 Tina had suggested the Carnagie library in Greenlake and that was my chosen subject during our sketch outing today. Frank C. was sketching in front of me so I put him in the sketch. The historic branch is listed on the National Register of Historic Places and has been named a landmark building by Seattle's Landmarks Preservation Board. It was designed by W. Marbury Somervell and Joseph S. Coté and opened in July 1910. And, well, that was a first! While I was sketching, a bird pooped on my sketch board! I was sitting under a tree, though. Fortunately, it missed me, my sketch and my palette. But, ugh! "Atmospheric" indeed. 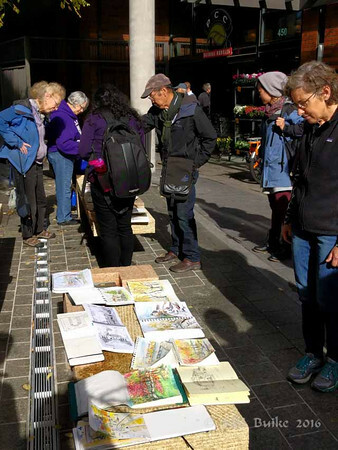 It was such a nice, sunny day that we shared our sketches on the plaza of PCC. Then had our group photo in the sun. 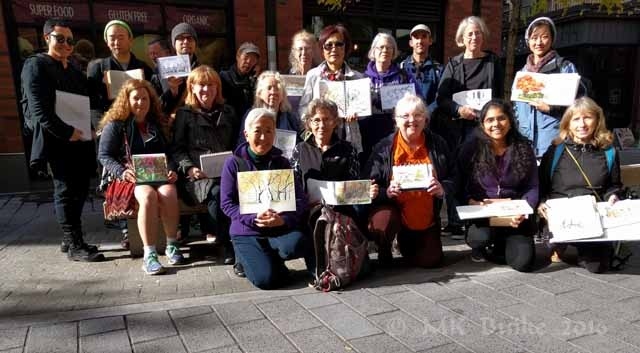 There seem to be one or two sketchers missing from the group photo. I agree with Stephanie, that library sketch is really nice. Isn't it funny how the photos look like night shots. The shadows were so dark. Mine came out similarly.